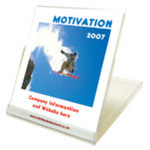 Our Customised CD box calendar is a pop-up CD style desk-top calendar. So give them away to your customers as a promotional giveaway and always be advertised. Lots more calendars besides our Customised CD box calendar click here. To find out more about our Customised CD box calendarclick here and fill in the contact form and we'll get straight back to you.